Pumpkin Creme Bars. OMG! These pumpkin creme bars are amazing! Since it’s technically September, it’s okay to start rolling out the pumpkin recipes. One can never have too many pumpkin recipes right? Especially when they are healthy pumpkin recipes. Since it’s still in the 100’s here in Texas, I thought my first pumpkin recipe of the season should be a frozen treat. So I am starting with these pumpkin creme bars. These bars are so easy to make and the recipe only contains 9 ingredients! 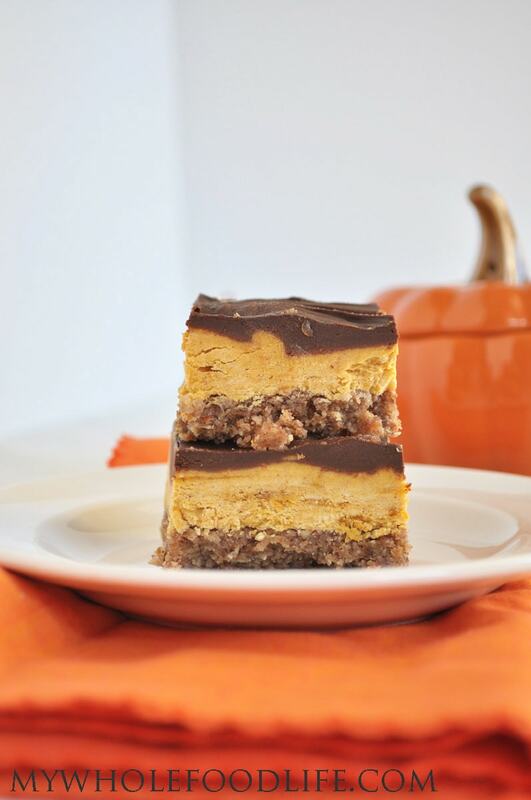 These pumpkin creme bars are vegan, gluten free, dairy free and even paleo friendly. If you needed a nut free option, I suppose you could use pumpkin seeds or sunflower seeds in place of the pecans. I love everything about this recipe. Starting with the cinnamon pecan crust, then the creamy pumpkin center and it’s topped with creamy chocolate. If you are a lover of all things pumpkin, you may also enjoy this post. I used vegan chocolate chips for my chocolate topping, but you can also probably use my 3 ingredient chocolate bar recipe. Here is a quick video on how to make the 3 ingredient chocolate. For more videos, you can subscribe to my You Tube Channel. A creamy chocolate and pumpkin dessert! In a food processor , mix the nuts and cinnamon for a minute. When you see the mixture start to get moist, add the dates and process until a loose dough starts to form. Line an 8x8 baking dish with parchment paper. Gently press the dough into the bottom of the baking pan. Stick in the the freezer while you make the creme filling. Make sure your can of coconut milk has been refrigerated overnight. Open the can and scoop the solid white part into your mixing bowl. You can save the remaining water for smoothies. Using the whipping attachment on your mixer , whip the coconut milk into a cream. While that is whipping, mix the remaining filling ingredients in the food processor . Gently fold the pumpkin mixture into the coconut cream. Once everything is incorporated, spread the mixture on top of the crust in the baking dish and place it back in the freezer. To make the chocolate topping, fill a saucepan with water and bring it to a boil. Place a glass bowl on top of the sauce pan. Put the chocolate chips and almond milk into the glass bowl and gently melt the mixture. You will need to keep a close watch and stir constantly. Once the chocolate is melted, spread it over the creme layer in the baking dish and place it back in the freezer to set. For best results, let the bars sit in the freezer overnight before cutting into squares. When you pull the baking dish out of the freezer, it will need to sit on the counter for about 5 minutes before it is soft enough to cut. These should last quite some time in the freezer. Enjoy!